Algae chocolate, algae ink, algae protein powder, algae as a solar technology and algae as a diversification strategy for tourist economies? Algae investors and project developers may be the most inventive group of people in the world when it comes to finding new market niches for the world’s oldest living oil source, friend of the dinosaurs and so on. Once there was the Summer of Algae, when it seemed that every start-up out of Silicon Valley had discovered algae biofuels; then there was the Summer without Algae, when they didn’t make much fuel, as it turned out; then, there was the Summer without Algae Companies, when so many of them merged or disappeared. But here comes another wave of companies and applications. Let’s look at these 5 new apps and their progress. The Algae Factory is a food company based in Wageningen and Amsterdam, founded in 2014. While studying at Wageningen University, the trio of co-founders developed the idea of producing healthy algae based snacks. First up, yes it’s algae chocolate, or rather chocolate with Spirulina, a cyanobacteria with a high content of protein, vitamins, minerals Omega 3 and 6, and essential amino acids. And the cocoa is selected to balance (and, ahem, mask) the flavor spirulina. Algae are seen as an innovative ingredient in Europe, while in other parts of the world like Japan and Korea are consumed daily. Our idea was simple: create a healthy and sustainable snack and combine it with an innovative social model called Bite4Bite, and the company is working with the Antenna Technologies Foundation, a Swiss NGO, to source algae from Africa as a development activity — specifically, Togo. 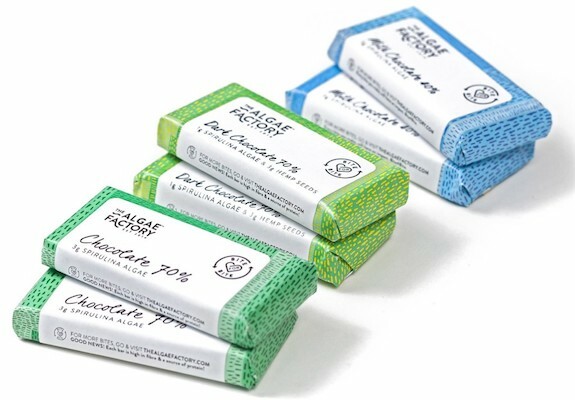 The chocolate bars are long in fibre and protein and retail for €2.50, both on the company website and in and around Amsterdam. At the moment The Algae Factory is merging with a technology provider Alga Tarifa SL and recently signed a collaboration agreement with the METRO/MAKRO group. We reported in February that Cellana and Living Ink Technologies signed a letter of intent for the joint development and commercialization of inks containing Cellana’s renewable algae biomass. Living Ink’s sustainable algae-derived ink is 100 percent plant-based, renewable and biodegradable. The majority of the ink is algae, turned into ink, and applied to paper. This novel ink will replace conventional ink that uses petroleum products and other finite chemicals, most of which are toxic. 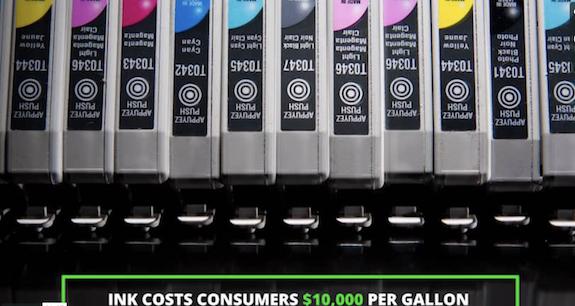 The big news from Living Ink is the development of a sustainable black ink. That’s the world’s most popular color by volume and the hardest to make sustainably. There’s another interesting app: a patent-pending time-lapse ink that grows when exposed to light, based on sustainable algae. “Imagine receiving a greeting card in the mail that says, “Happy Birthday” and the next day a cake appears, and on the following day, candles appear on the cake,” says company CEO Scott Fulbright. The company has raised over $100,000 through business pitch competitions including The United States Department of Energy, SXSW, University of Colorado, Colorado State University, and the Blue Ocean Enterprise Challenge. 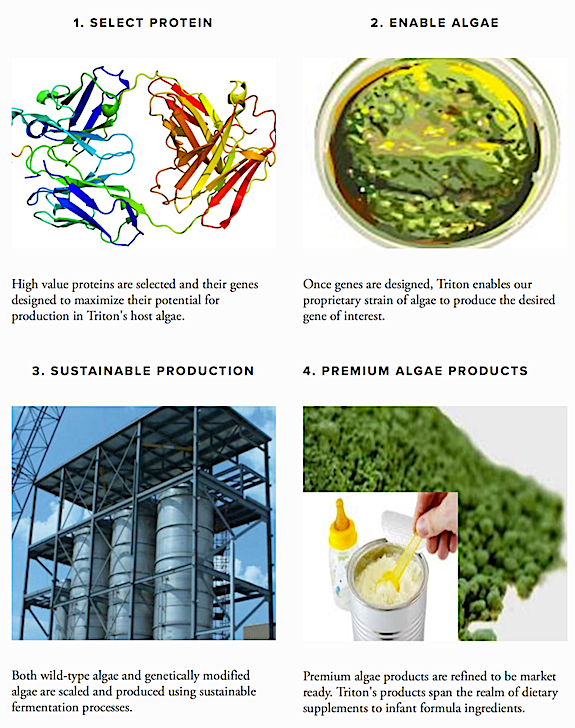 News arrived this week from Triton Algae Innovations, which is now focused on food and nutritional products derived from algae, the company has achieved GRAS (Generally Recognized As Safe) status for its wild-type algae Chlamydomonas reinhardtii (c. reinhardtii). Triton’s algae will be used as an ingredient in foods and beverages, such as snack or nutritional bars, cereals, yogurts, fruit and vegetable juices, smoothies, and sports or energy drinks. Triton plans to introduce its algae into the consumer market in 2018. Another technology to watch at Triton — the company’s original target, which is a proprietary process in which this same algae is used to express a variety of different proteins which occur naturally in the breast milk of all mammals, including humans. 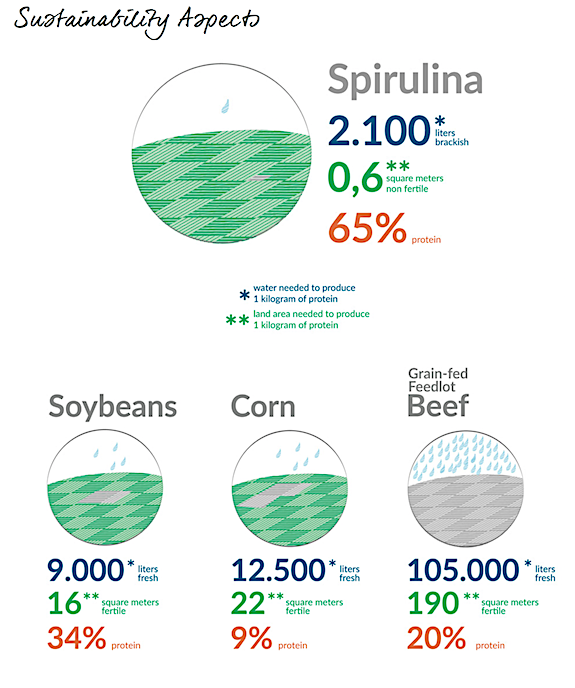 To date, there has existed no commercially viable source of these proteins. One of these proteins, osteopontin (OPN), has been found in animal trials to reduce occurrences of intestinal distress and fever, as well as to have a positive impact on cognitive development. Stay tuned for more on that one as it moves through trials. These are biophotovoltaics (also known as biological solar-cells) which use the photosynthetic properties of microorganisms such as algae to convert light into electric current that can be used to provide electricity. What’s new? To date, all the BPVs demonstrated have located charging (light harvesting and electron generation) and power delivery (transfer to the electrical circuit) in a single compartment; the electrons generate current as soon as they have been secreted. Building a two-chamber system allowed the researchers to design the two units independently and through this optimize the performance of the processes simultaneously, and miniaturize. How good? With a power density of 0.5 W/m2,, that’s 5X better than previous bio-cells, yes, but it’s still one-tenth of conventional solar fuel cells. Key among these? Storage. Separating the energy generation and storage components has other advantages, too, say the researchers. The charge can be stored, rather than having to be used immediately – meaning that the charge could be generated during daylight and then used at night-time. Especially useful in off-grid systems, and the researchers point to lesser-developed countries that also would be able to locally replicate, rather than importing, the fuel cell technology. Wageningen University & Research has partnered with the Council of International Education and Exchange to build a small-scale algae pilot on the isle of Bonaire in the southern Caribbean. The Wageningen AlgaePARC, which aims to optimize algae cultivation, launched development with an €800,000 grant that arrived at the end of 2016 from the Netherlands Organisation for Scientific Research. In the lab, scientists have managed to use algae to convert 6.5 per cent of the added solar energy into chemical energy. In the outdoor test facilities in Wageningen the yield is stuck at 3.5 per cent, however, as the conditions in the Netherlands are far from favorable. This is where Bonaire comes in. At the same time, it’s a potential for diversifying the Bonaire economy away from its dependency on tourism, and there are hopes for the long-range potential of algae jet fuel.